Back of Beyond Baking: A diet Spring clean! It is the first week of March and there definitely seems to be hints of spring popping up about the place. Daffodils are starting to show their sunny heads, the blueberry bushes are starting to burst their buds, Mr Vander-Cave is muttering about potato varieties for the coming season and the sounds levels on the farm are increasing. The main lambing period is fast approaching and preparations need to be completed. Master Vander-Cave came back in this morning, after accompanying the farmer on his twice daily sheep welfare (ante-natal) check, to tell me that one of the ewes had lambed by itself in the field. He had helped the farmer and his son collect the sheep and it's new born lamb to take them back to the barn because it is too cold for the lamb to survive out in the field. I do sometimes feel I am living in the middle of the BBC Lambing Live programme! With thoughts of warmer weather in my mind I decided I really need to start eating a little healthier. As I start to come out of winter hibernation and shed the jumper and chunky cardigan combo I wear for much of the winter (and preferably the half stone of insulating fat that I have had warming my midriff) . Living in a stone and wooden barn with stone flooring can be quite chilly, do you know! Of course the problem with healthy eating is that cake is not particularly compatible with this lifestyle and to be honest, for me, life without cake is one I do not wish to participate in. I know one can go into any supermarket and find shelves groaning under the weight of so called "diet cakes" which are usually either labelled low fat or low calorie and often made by diet companies as treats that fit in with their particular diet plan. My big problem with these cakes is that they are often tasteless and full of additives to compensate for the missing fat or calories. I would much rather have a smaller piece of calorie laden, flavoursome, home made cake or eat said cake slightly less often, whilst adding some exercise into the mix. Better that than eat one of these 'cardboard slices' which are (usually) individually wrapped for convenience, which is ridiculous because you need to eat half the packet to get one decent sized piece of cake! Having said all of this I did find myself (and my trusty Google search engine) searching for healthy cake recipes. Many of the recipes I found had strange ingredients never heard of on this side of the 'pond' and used chemically enhanced sweeteners which kind of defeats the object of healthy eating to my mind. 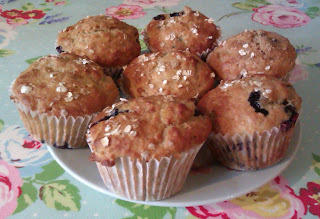 Eventually I struck gold with a great recipe for blueberry, banana and oaty muffins. This recipe is a winner as far as I am concerned because it utilises blueberries which we often find ourselves over run with during the summer months. It also has oats and bananas in which are a slow release carbohydrates which keep one feeling fuller for longer and all wrapped up in a generous sized moist muffin with only 206 calories. I was totally over excited about making these muffins and half expected to be sorely disappointed by the end result but I am pleased to report they turned out beautifully, moist and flavoursome and exceptionally easy to make. Heat oven to 180C and line a 12-hole muffin tin with paper muffin cases. the remainder into the flour mix. Make a well in the centre of the bowl . Pour the liquid mixture into the well and stir quickly and sparingly with a large metal spoon. The mix will look lumpy and may have the odd fleck of flour still visible, but don't be tempted to over-mix. Tip in the blueberries and give it just one more stir. Divide the mix between the muffin cases - they will be quite full - then sprinkle the tops with the final tbsp of the oats and the rest of the sugar. Bake for 18-20 minutes until risen and dark golden on top. Cool for 5 mins in the tray before lifting out onto a rack to cool completely. I have frozen half my batch and they can be individually defrosted, wrapped in foil and popped in a warm oven for 5 minutes to refresh them. *If you are unable to get buttermilk it can be replaced by a makeshift buttermilk by mixing a tablespoon of lemon juice with 280ml skimmed or semi skimmed milk and leave it to stand for 5 minutes to ferment and then use as in the recipe. This is a great recipe apart from the fact that you only use the egg whites. What do you do with the yolks?